The easier version of this cake would simply be a 24cm (9inch) two-layer cake, so if you don’t have any small cake tin, just go for that. Remember, enjoy the flavors when you eat this, sipping a cup of tea and celebrating spring, love, and hope. Like I did. To Meghan and Harry! For the cake line a 24cm (9inch), 15cm (6inch) and a muffin tin with parchment paper and grease the sides. Alternatively line two 24cm (9inch) cake tins if you want to make a one-tire cake. Preheat oven to 180 degrees Celsius. Sift the flour with baking powder, baking soda, salt and lemon zest in a bowl and set aside. Mix the buttermilk with the lemon juice and also set aside. Now beat the soft butter with the sugar for a few minutes, add one egg at a time and incorporate fully, add the vanilla extract last until combined. Alternating the flour mix with the buttermilk, add the rest in three turns. The cake mix will be very thick. Pour into prepared tins and bake, take out muffin at about 12 minutes, the smaller cake at 20min and the biggest cake at 25-28min. All should look golden on the top. Let cool completely before taking out of the tins and wraping in plastic wrap. Chill in the fridge. You can prepare the cakes the day before, chill in the fridge until further use. Meanwhile for the lemon curd place all ingredients except for the butter in a medium-sized pot. Make sure you check beforehand that the pot fits, without touching the bottom, into a large pot as you will have to thicken the curd in a double-boiler. Pour water about 4-5cm high into the large pot and bring to boil. Then reduce temperature so that water simmers. Make sure the water is not too hot, but really only simmers. Now place the pot with the egg mix on top and check whether you find it too sour. If you do, feel free to increase the amount of sugar. Start whisking. Whisk all the time. It takes about 10 minutes for the curd to start thickening, so don't increase the temperature too early as otherwise the egg yolks will curdle. If it doesn't thicken after ten minutes, increase the temperature gently. Once you have the consistency of a thick sauce, take the pot out (still stirring) and slowly add the butter. I usually cut the butter into 4-6 pieces and add one piece at the time. Transfer to a jar and chill. For the frosting place heavy cream and elderflower syrup in a bowl and beat until soft peaks form. Add the mascarpone cream and beat until stiff peaks form. Chill until further use. To assemble the cake first cut all three cakes in half using a serrated knife. Brush the bottom layer with the elderflower syrup. Then pipe a ring around the edges with the mascarpone cream (see pictures) and fill the middle with lemon curd. 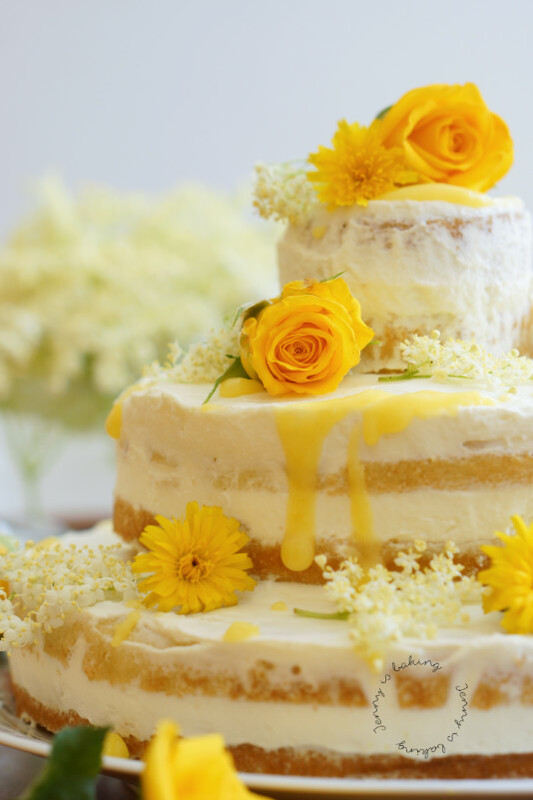 Place the second half of the cake on top, brush again with elderflower syrup and frost the top and sides with further mascarpone cream. Assemble the medium and smallest cake seperately in the same manner before stacking on top of each other. 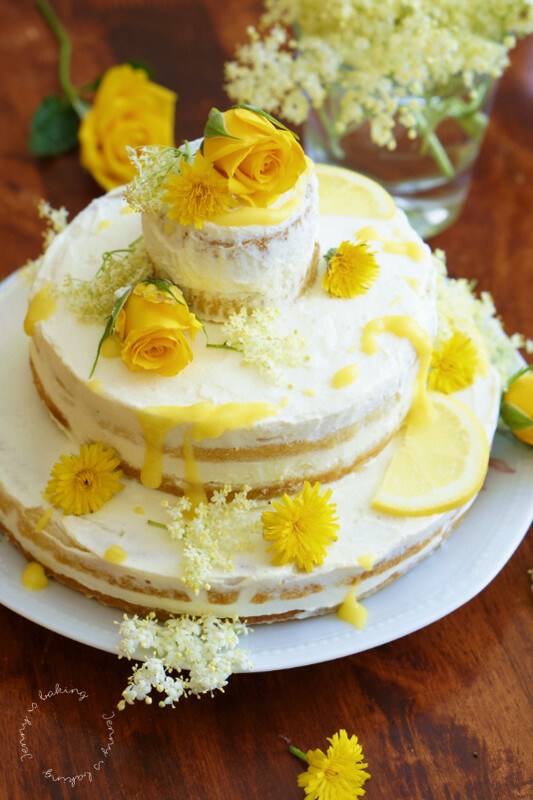 Use additional lemon curd to create a bit of a "dripping cake", see pictures. 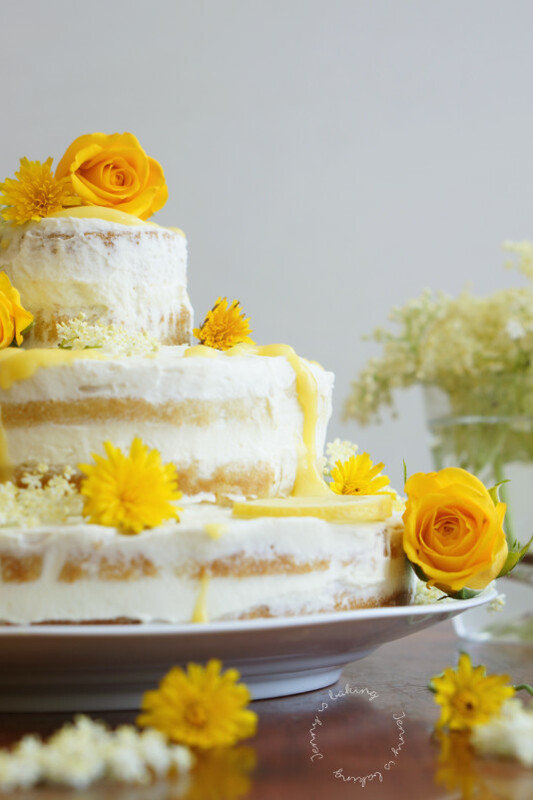 Decorate with fresh flowers and lemon slices. wow! Wow! WOW! Ich bin absolut begeistert und ordentlich beeindruckt! …und freue mich natürlich unheimlich, dass du beim Marktspaziergang dabei bist! Danke Simone! Sie sieht viel schwieriger aus als sie zu machen ist, der oberste Teil ist ein Cupcake, ist also wirklich eine Miniversion. Es hat sehr Spaß gemacht mitzumachen, tolles Blogevent!